We are at the end of February, but looking out the window, spring already seems to have blossomed! In the central hours of the day you can walk around the center of Faenza even without a jacket, to the warmth of this unusual winter sun. And after the beautiful windows of Piazza del Popolo you could take a walk in the shadow of the Cathedral, up to Via Sant’Ippolito. At number 23 / a you will find our shop La Vecchia Faenza where, behind the great exhibition of artistic ceramics, you can visit the laboratory where our creations are born. 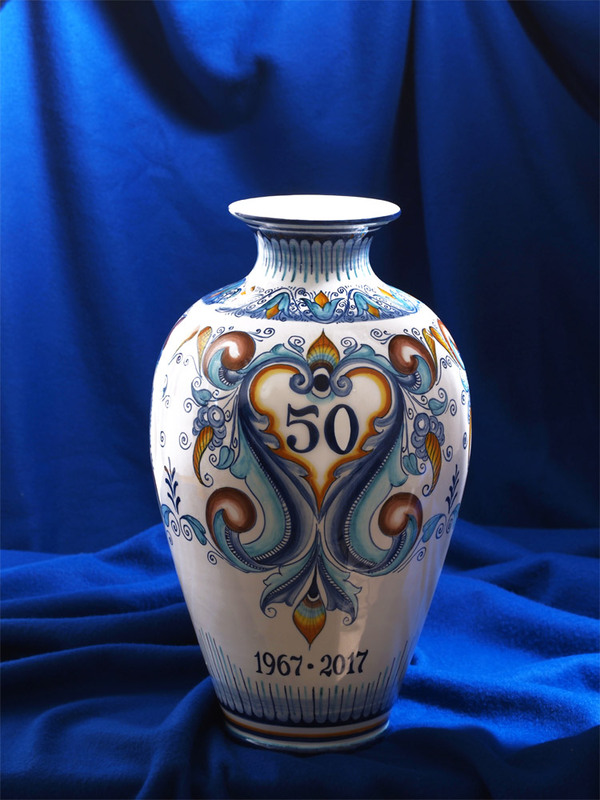 A tradition that begins in antiquity – even in the first century A.C. – and became famous in the world in the 1400-1500, when most of the decorative styles that became symbol of the ceramics of Faenza are born. And the processing technique, from the fifteenth century to today, has remained the same! 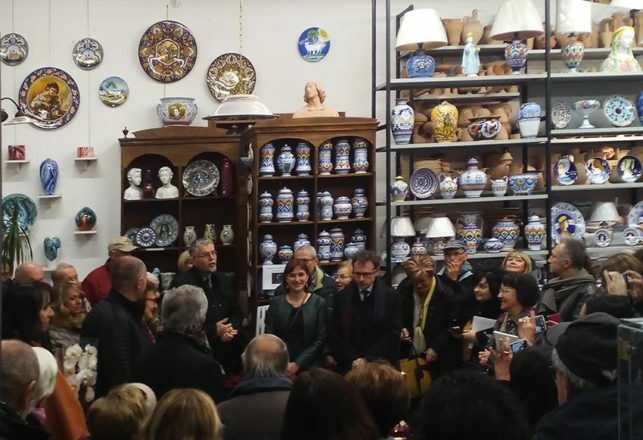 The visit to the La Vecchia Faenza ceramic laboratory is therefore a real journey into one of the oldest and most appreciated traditions of Italian craftsmanship. An opportunity for groups and schoolchildren to look at a tradition that is still alive in the gestures and words of our ceramists, always available to explain each stage of processing. The ones you see in the photos below are some of the pieces we produce since the 80s, of different sizes and with some variations, inspired by a fifteenth-century vase probably made in Faenza and kept at the Victoria and Albert Museum in London. The idea of ​​re-elaborating the decoration of such an ancient and important ceramics came to us during a visit to the famous London museum in the late ’70s: we had just started the activity and we were literally enchanted in front of a room full of Renaissance ceramics (at that time the museum spaces were not rationalized like today: the display density was greater, there were a great quantity of pieces in a single room and the glance was of great impact). We were not equipped with a camera, so we pinned on a notepad the decorations of some pieces, among which the vase decorated with braided neck animals that we interpreted as a symbol of marriage, love and, in general, of union; it was probably commissioned to give a couple of newlyweds a present. We have thus created plates and vases in majolica variously decorated: in the picture you can see a vase painted similarly to the original and a plate that instead brings the birds with long braided neck surrounded by decorations in Pavona and Persian Palmette styles. This large, hand-painted Raphael style plate with a scene inspired by Thomas Gainsborough’s painting “Conversation in a Park” is now available in our e-commerce. 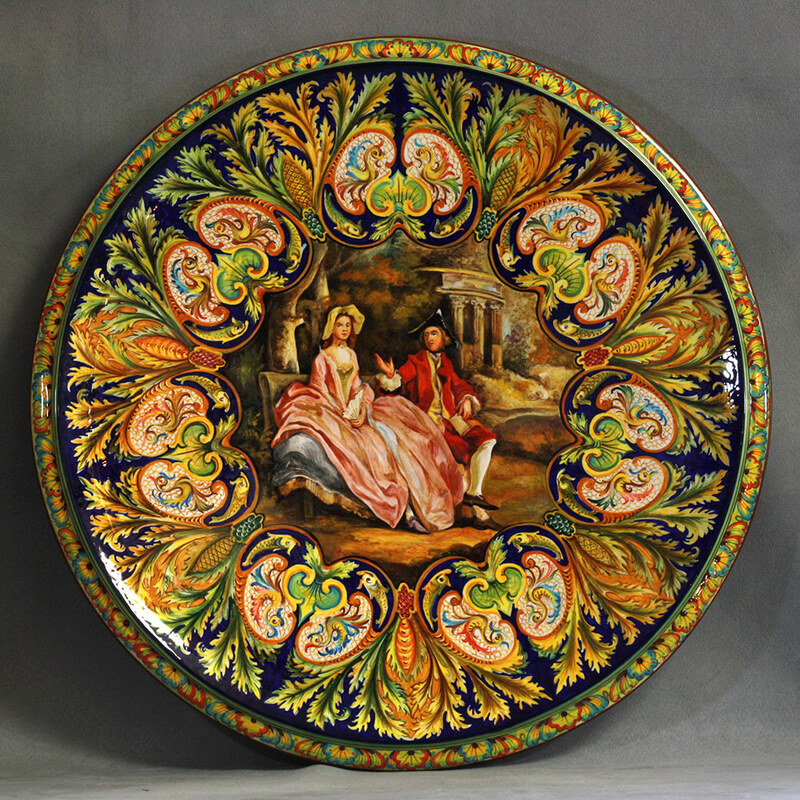 Around the eighteenth-century scene, 7 medallions on an elaborate of leaves present small raphaelesque – little dragons and dolphins – created on the designs of the ceramist Giovanni Pretolani and painted in bright colors. The medallions stand out against the nuances of the leaves, ranging from spring green to autumn browns. 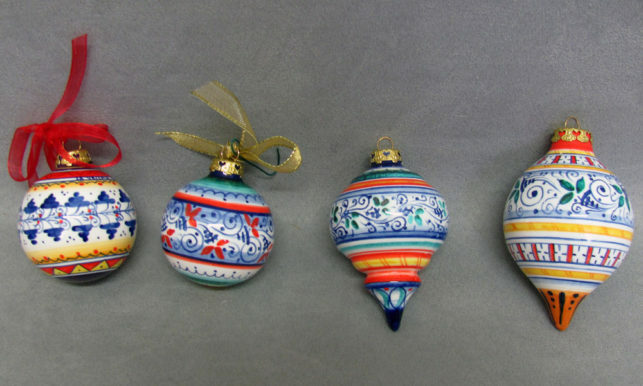 It is a unique piece, particularly valuable for the great effort required both in terms of decorative capacity and for the hours of work required. Once exposed, you will spend long moments staring at it to catch every detail of its minute decorations. Buy the plate on CeramicaFaenza.it! With the weekend of the Immaculate one approaching, we are getting ready to enter the Christmas climate. Faenza is ready to welcome you in its beautiful square already set up with the lights, each year different, and the Christmas tree placed next to the Monumental Fountain set up in a flowery meadow. 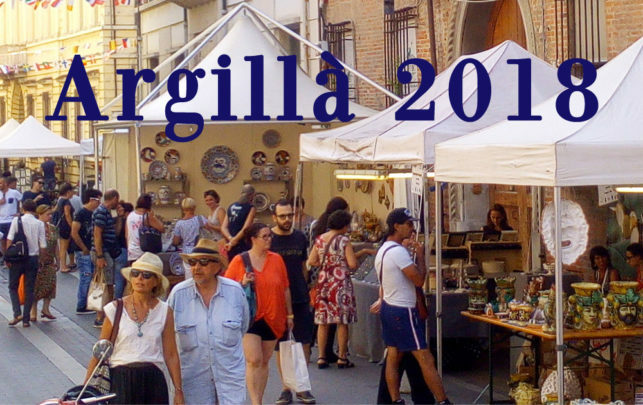 2 years have passed since the last Argillà, Faenza is preparing to welcome from August 31st to September 2nd 2018 two hundred exhibitors from all over the world and many visitors who will fill Piazza del Popolo and the main arteries of the historical center: Corso Mazzini, Corso Baccarini and Viale Baccarini, from the MIC International Ceramics Museum to the main square. On the occasion of the Summer Tuesdays in Faenza, we participate in the initiative of the “Amici della Fontana” association that on Tuesday 3 and Tuesday 17 July will accompany the public in the basement of the Monumental Fountain of Piazza del Popolo, to discover the mechanisms that make the source. 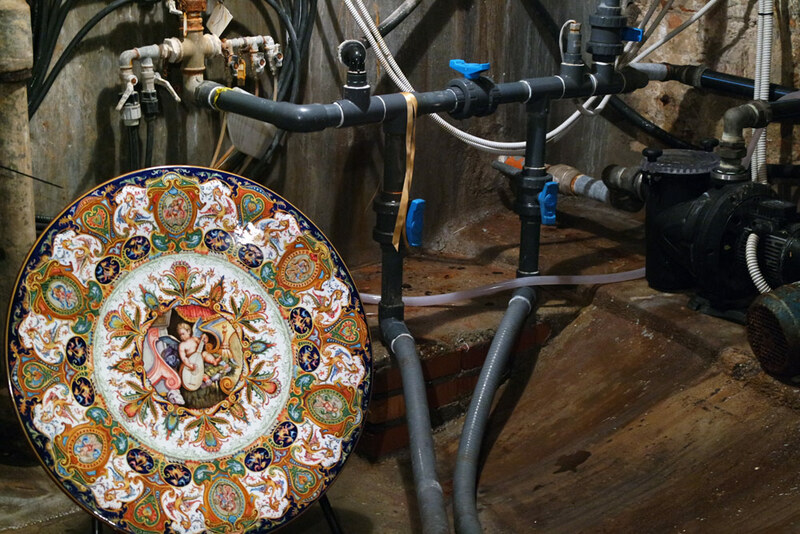 In this ancient and suggestive place we have placed one of our “historical” pieces: a large raphalesque plate created in collaboration with Giovanni Pretolani. The Cinquecento of Caravaggio and Raphael on display at the San Domenico Museums … and in our ceramic workshop! “The Eternal and the time between Michelangelo and Caravaggio” is the new exhibition of the San Domenico Museums in Forlì to be held from 10 February to 17 June 2018 in the convent church of San Giacomo Apostolo, freshly restored. The Cinquecento, a century that saw the dawn of the Renaissance and the appearance of a new current, Mannerism, as well as Michelangelo and Caravaggio, will be Rahpael, Parmigianino, Vasari and many others (the list is very long!). After having filled your eyes with the wonderful works of these artists of the sixteenth century, we invite you to rediscover the same atmosphere by visiting our exhibition of artistic ceramics. The bond between the ceramists and the painters was solid from the beginning, as demonstrated by the works of the great Xanto Avelli (1486-1542), whose ceramics bear the marks of masters of the period such as Raphael, Mantegna and Parmigianino. We at La Vecchia Faenza, like Xanto Avelli, also have our reference painters who are a source of continuous inspiration. 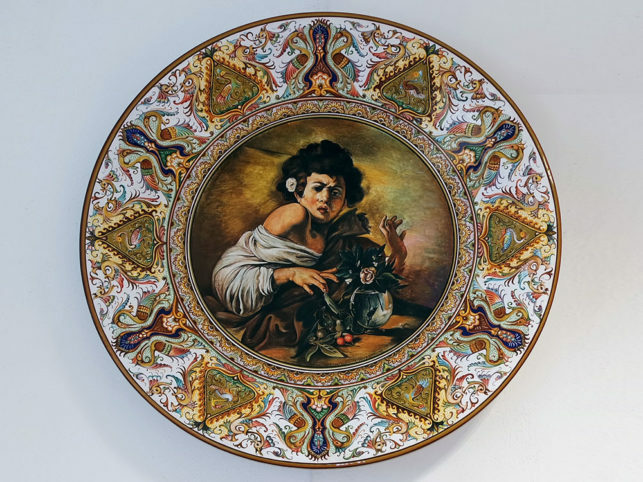 As shown in the painting at the center of this dish, taken from the “Boy bitten by a lizard” by Caravaggio. The celebration of our 50 years together with you! On Saturday, November 18, we celebrated the 50th anniversary of La Vecchia Faenza: a great achievement that we had the honor to celebrate together with the many authorities present and our customers, some coming from far away. Your great participation has made us happy, even for this the party was wonderful! These words of Gino Suzzi, founder of La Vecchia Faenza, well tell how our story began. Who could have imagined that young Laura, a few years later, would become Gino’s life partner and, since 2004, would take over La Vecchia Faenza’s guide? 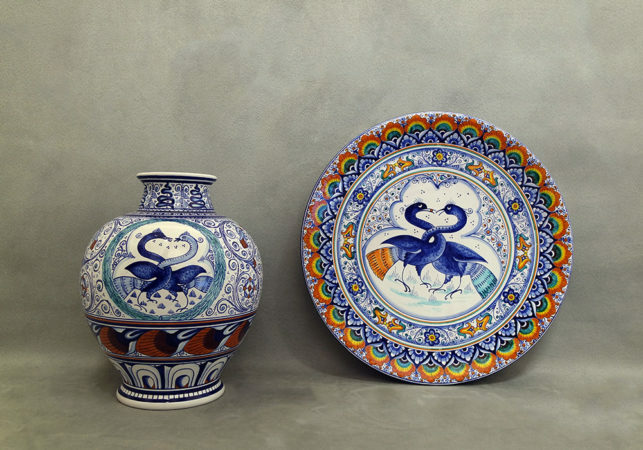 The plots of chance and destiny intertwined, giving rise to a reality made of passion for decoration and ceramics, in the wake of a glorious past that made Faenza famous in the world for its beautiful majolica. On November 18, at 16 we celebrate together with wine, roasted chestnuts and donut our first 50 years in business! At 17 o’clock there will be the cake cut in the presence of mayor Giovanni Malpezzi and deputy mayor Massimo Isola. We are waiting for you at La Vecchia Faenza, via Sant’Ippolito 23/A, Faenza.